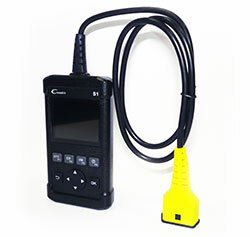 OBD-II mini scanner with color screen. Supports all OBD and CAN protocols (also P1, U1, B1, C1), can read freeze frame, live data (digital or up to 4 grapic in same time), USB 2.0 update, specific OBDII tests. Free updates via Internet. For tehnicians and car owners. European version. Vehicle running live data recorder from engine ECU. This tool is for periodically and difficult electronic defects fixing - for example, if engine coolant sender not work periodically. Allows read fault codes via program on the PC. Write data into 24 hours continious flash memory.